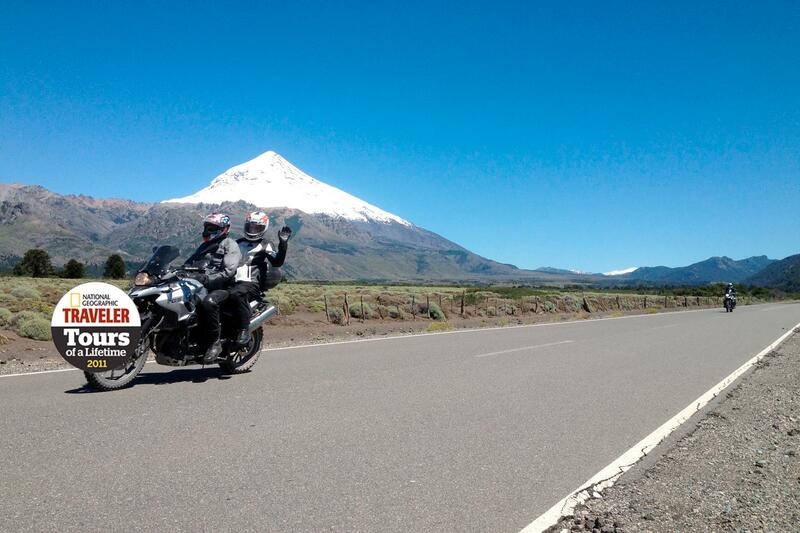 Motorcycling through Chile and Argentina will be some of the greatest biking moments of your life. This adventure is a scenic overload; beginning in the Chilean Lakes district town of Pucon we ride into Argentina and onto Bariloche, via the famous seven lakes ride, every inch is a scenic splendour. Further south we enter the vast and remote Patagonia stopping overnight at a, still working, Estancia before riding into more sensational scenery as we hit the Andes at El Chalten. 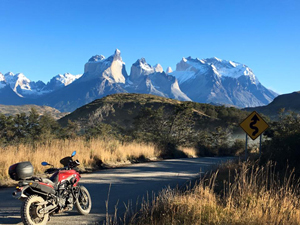 No motorbike tour to this region should miss the incredible Moreno Glacier, we ride our bikes out to this staggeringly beautiful part of Patagonia before riding into Torres Del Paine National Park with it’s deep blue glaciers and lakes. This place will leave you awe struck and we dare to say that it is possibly the most scenic motorcycle ride in the world. 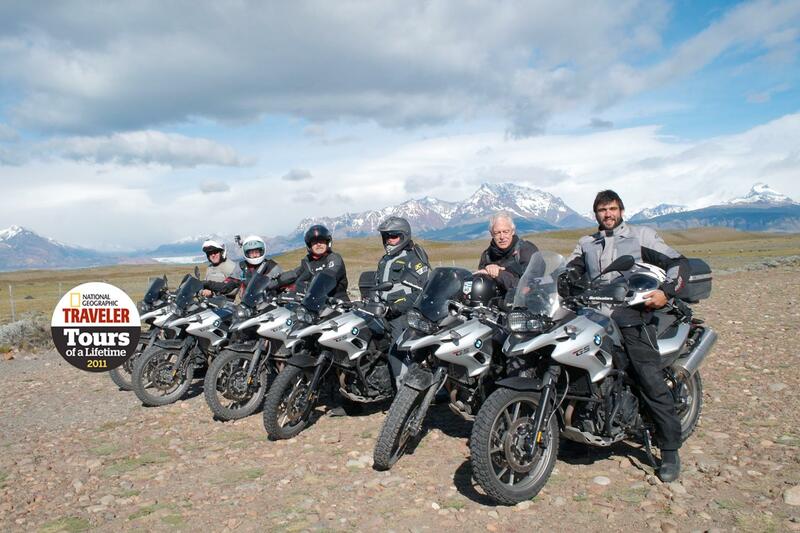 This is an incredible motorcycle tour through some of the most amazing, remote and mythical regions in the world, no wonder it’s our top selling tour. Joining Day: Your Santiago airport transfer will take you directly to our joining hotel, ready for an early start tomorrow. Today you will meet your crew for your tour briefing and welcome dinner. Day 1: A morning flight and group transfer to Pucón, where you will pick up your bikes and have your orientation/safety ride. Day 2: Today you’ll have a free day to explore Pucón. Day 3: A scenic ride and your first border crossing into Argentina, our overnight stay is stunning San Carlos de Bariloche. Day 4: A free day for you to explore San Carlos de Bariloche. Day 5: Today’s ride will take you towards the sparsely forested foothills of the Western Chubut province, arriving for a restful night at Esquel. Day 6: Riding through some stunning Patagonian wilderness, you will stop for the night in the remote settlement of Perito Moreno. 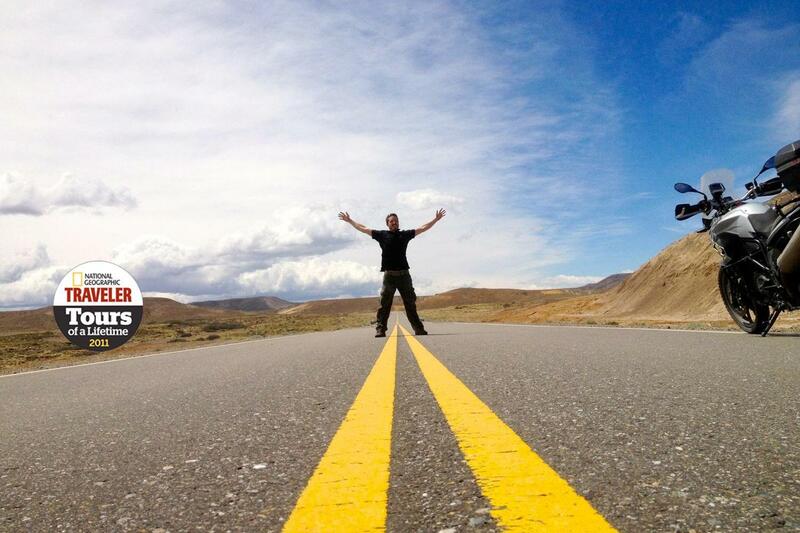 Day 7: The horizon seems to stretch on forever as you ride to a beautiful and remote estancia (Argentinean farm). Prepare yourself for a fantastic traditional Argentinean meal. 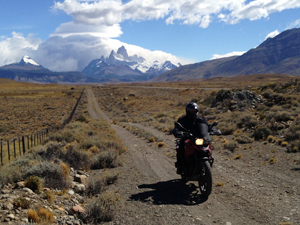 Day 8 & 9: You’ll ride across the plains to the peaceful village of El Chalten in the shadow of the Fitzroy Range. Two nights in El Chalten will give you a chance to take a walk into the range and give our legs a much-needed stretch. 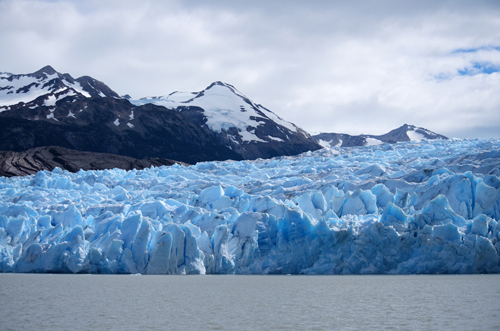 Day 10: Today you’ll head further south to the town of El Calafate for a two-night stay. Day 11: Ride out to the spectacular Moreno Glacier and enjoy the day in the National Park. 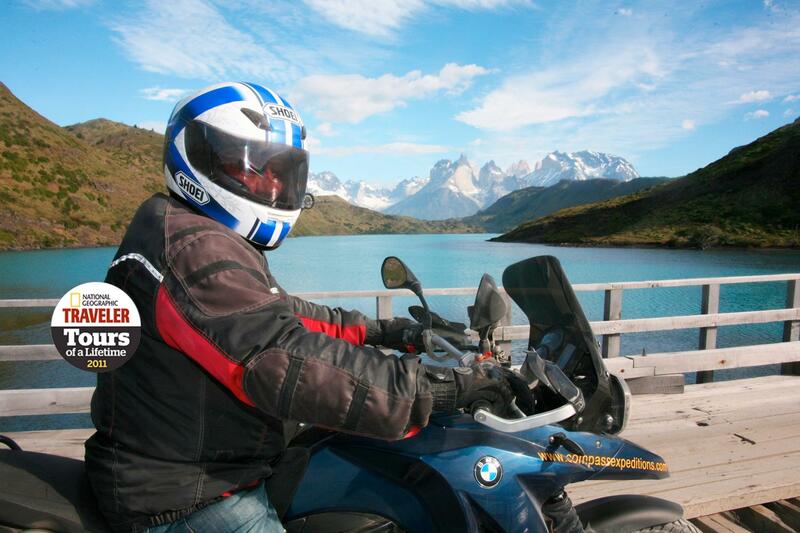 Day 12: Today’s ride will take us back into Chile and into the beautiful Torres del Paine National Park. Day 13: You will have a full day to hike the rugged trails throughout the park or ride among the many winding roads that cover this region. The choice is yours. Day 14: Leaving Torres National Park, you’ll ride out to Puerto Natales and then cross the Magellan Straits to our overnight accommodation in Cerro Sombrero. 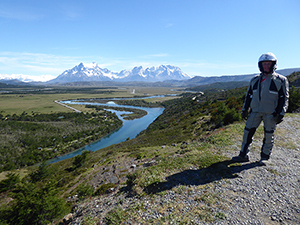 Day 15: Ride triumphantly into the southernmost city in the world, the beautiful Ushuaia. Day 16: Enjoy a morning Beagle Channel cruise (optional) or ride through the Tierra del Fuego National Park to the end of the world. We will leave after lunch for a short ride to Rio Grande where we will overnight. 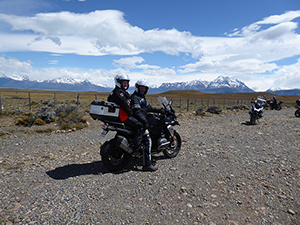 Day 17: We travel north back into Chile, riding alongside the Magellan Straits to the town of Punta Arenas where we will return the motorcycles. Day 18: Your included flight will take you to the capital of Santiago for your final night of the tour. Departure day: Spend some time in Santiago or fly home, the choice is yours. Joining Day: Your Santiago airport transfer will take you directly to our joining hotel, ready for an early start tomorrow. Day 1: Today you’ll take a flight from Santiago to Punta Arenas, where you’ll meet your crew for your tour briefing and welcome dinner. Day 2: We cross the Magellan Straits and ride to our overnight accommodation in Rio Grande. 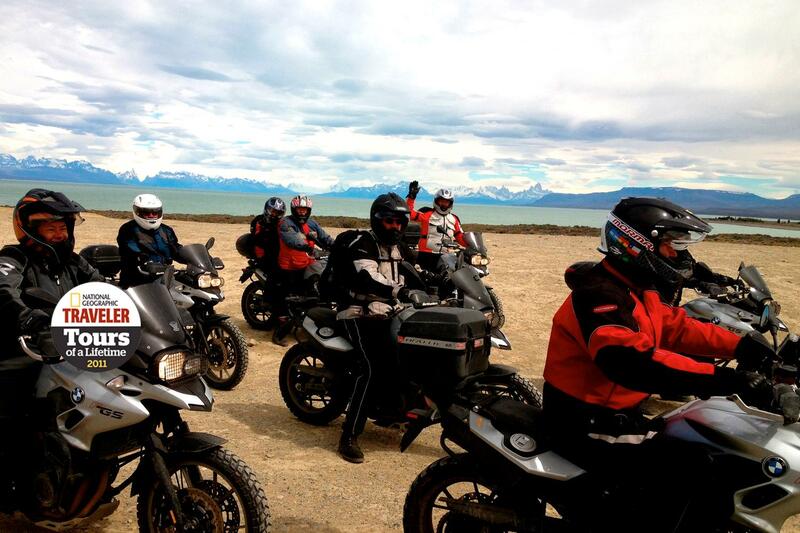 Day 3: We ride to the southernmost city in the world, the beautiful Ushuaia. 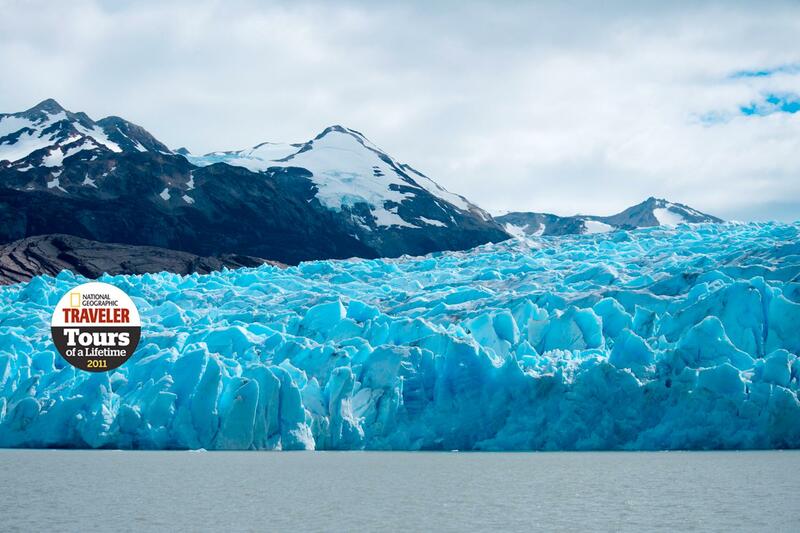 Enjoy an afternoon Beagle Channel cruise (optional) or ride through the Tierra del Fuego National Park where you’ll truly come to the end of the world. Day 4: You’ll ride through the southern forests and mountains to arrive into Chile and onto your overnight stay at Cerro Sombrero. 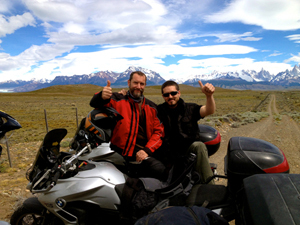 Day 5: Crossing the Magellan Straights, you will ride into Torres del Paine National Park. Day 6: You will have a full day to hike the rugged trails throughout the park or ride among the many winding roads that cover this region. The choice is yours. Day 7: Today’s ride will have you crossing the border back into Argentina. 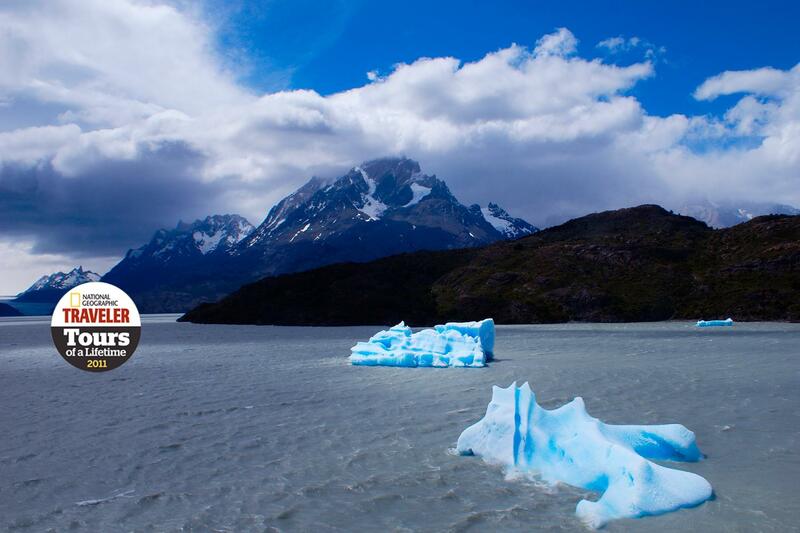 Your overnight stay is El Calafate. 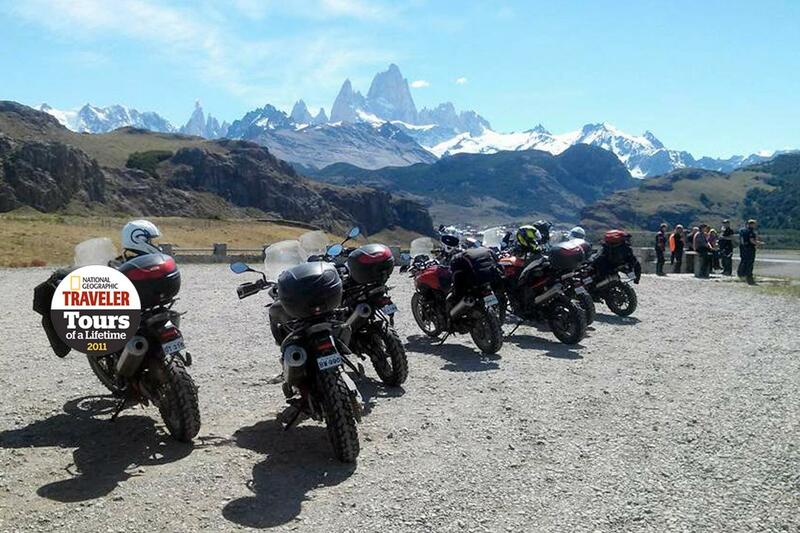 Day 8: Ride out to the spectacular Moreno Glacier and enjoy the day in the National Park. 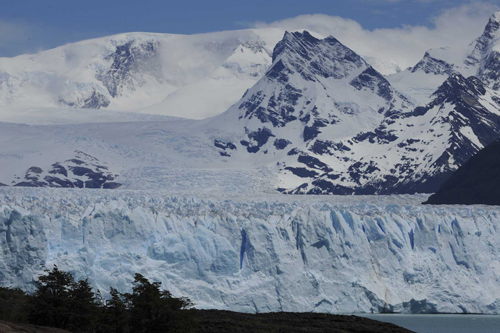 Day 9 & 10: Today you’ll head north to the town of El Chalten, nestled in the shadow of the Fitzroy Range. Two nights in El Chalten will give you a chance to take a walk into the range and give our legs a much-needed stretch. Day 11: The horizon seems to stretch on forever as you ride to a beautiful and remote estancia (Argentinean farm). Prepare yourself for a fantastic traditional Argentinean meal. 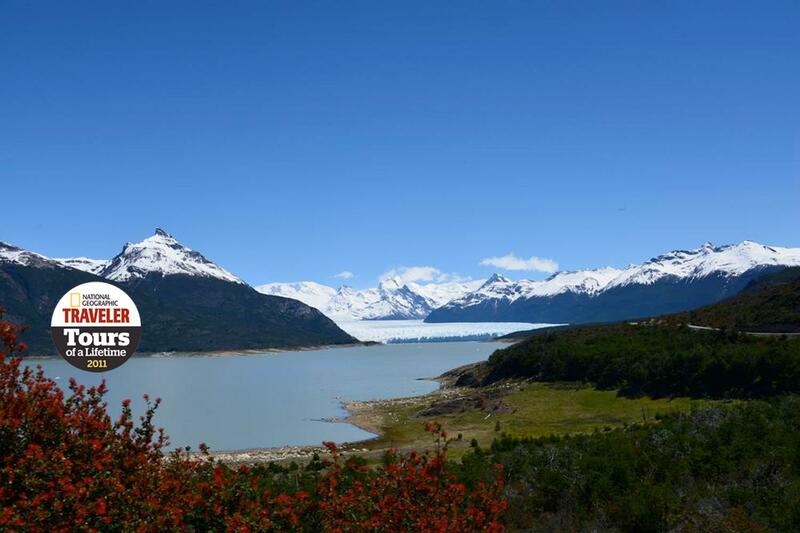 Day 12: Leaving the estancia you’ll continue north and stop for the night in the remote settlement of Perito Moreno. Day 13: Today’s ride will take you towards the sparsely forested foothills of the Western Chubut province, arriving for a restful night at Esquel. Day 14: A scenic ride into the forested mountains and lakes area, our overnight stay is stunning San Carlos de Bariloche. Day 15: A free day for you to explore San Carlos de Bariloche. 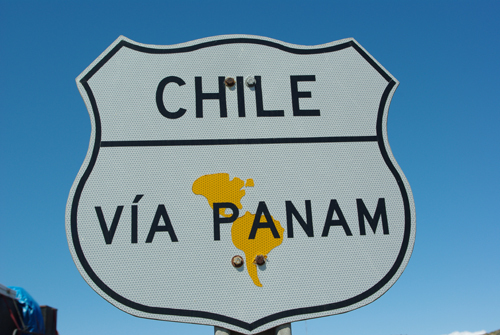 Day 16: Today you’ll cross back into Chile and ride into Pucón for your overnight stay. Day 17: The ride north today is toward the wonderful Salto Lago where you will be spending the night. Day 18: Today will see you continue north and onto the vibrant capital of Chile, Santiago for your final night of the tour. 80% of this ride is on pavement; some sections of pavement can be potholed and narrow. 20% of this ride will be on dirt. Most dirt is hard packed, although there are sections that can have loose gravel and can be rutted. Additionally, wind can be a factor on this ride. The Highlights? Scenery, riding, food, wine, company, not necessarily in that order. Love Compass and I think you are unique in the industry. A great team and fantastic rides. I’m a customer for life no question. For us this tour was more adventurous/challenging than other tours, with different operators, that we have done. The unpaved roads made the difference. Brenda wisely decided to ride in the van on some of the more challenging/rough sections - this made it easier for me! I would rate this tour 8/10. We have enjoyed the tour to Ushuaia immensely, it certainly had a mega, mega, wow factor for us. Ruth enjoyed it as the only pillion, taking photo's with her usual aplomb! 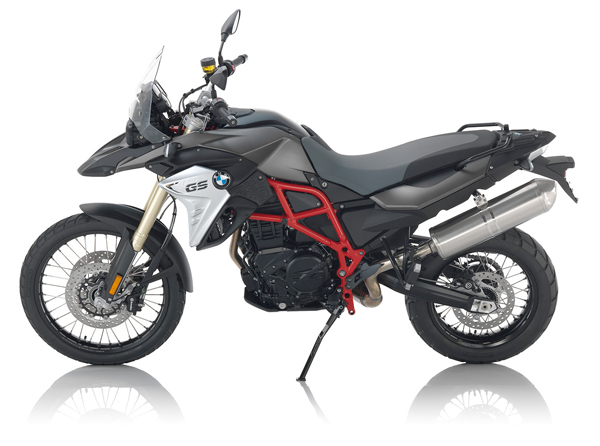 Firstly, thank you for making it possible for us and providing the BMW 1200GS. Then the same old question, how can we top this tour? Secondly, thanks to Felix and J. C., who dealt competently with the group and incidents along the way with great humour. I know you guys are busy getting ready for the next tour, but I just wanted to say how much Linda and I appreciated your professionalism and personal skills. You guys both did a fantastic job! Compass Expeditions is privileged to have you guys. Chris and I are just back from Santiago today after a wonderful bike tour from Ushuaia to Santiago with Hugo and Denis. We can’t speak highly enough of these 2 very impressive young guys. They went out of their way to look after the group and displayed absolute professionalism throughout the 18 days. My congratulations on hiring them; they do your company proud! I just returned from the Patagonia Explorer trip and had a fantastic time and now I want to learn more about the London to Madagan Road of bones tour! While this was only my third organized tour, those two young men were by some measure the most impressive group leaders I have ridden with. Hugo is mature and self possessed way beyond his 28 years. Dennis is an absolute joy to be around (not to mention a formidable rider). Great job with them; they did Compass very proud. Great trip and Hugo and Dennis are perfect for the job. Compass is only as good as the people you employ and they were absolutely professional. I thoroughly enjoyed this trip and they were one of the reasons for that. We had a blast on the Patagonia ride! Enjoyed the trip immensely. The tour guides Hugo Penasco and Dennis were top notch, professional, personable and available. 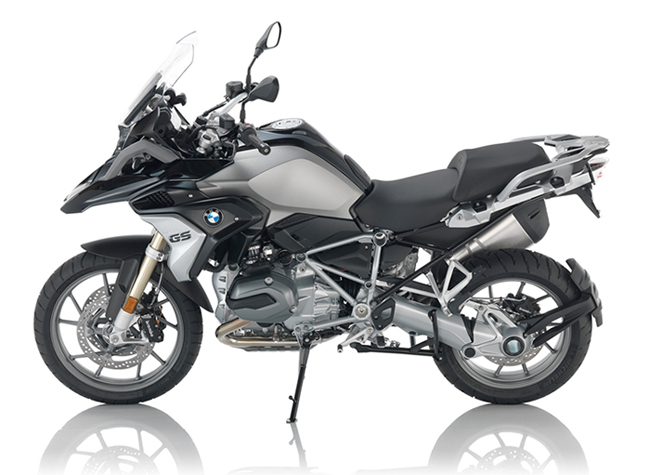 Must give a big thank you to Compass Expeditions for providing the excellent BMW 700 GS (it’s actually 800cc!!) The bike cruised on tarmac easily at the legal limit and more if required. On gravel you could safely purr along at 60-80k in 5th or 6th gear standing on the pegs or sitting. A big thank you to the crew on the trip, Danny and Justin. They are both perfect for the job, with Danny enthusiastically leading the way with the ever present Justin checking on the stragglers and arriving at chosen stopping places with the truck , trailer , the impressive Compass Picnic and his laconic smile. Above we see Danny and Justin loading up a days supply of essential stores!! Best trip I have ever done in my life, unbelievable! I had a fantastic tour with your company. I can’t tell you with words how impressed I am with the people you have working for you. How you managed to find two guys like that, while you reside on the other side of the world is amazing. Roberto and Feddy are a definite asset to your company. I had already been looking at the possibility of doing the Highlights of Peru tour even before I left for Chile. Is it true that Roberto and Federico also lead that tour as well? Well organized – Local knowledge good. Nothing too much trouble. Language skills excellent. No hesitation in recommending or availing to further tours – Great 10 days. Many thanks. You get to do it at your own pace, if you want a break, you have a break, there is no pushing, if you want a photo you take a photo! It’s been a great trip from start to finish, all in all absolutely no complaints, it was super! 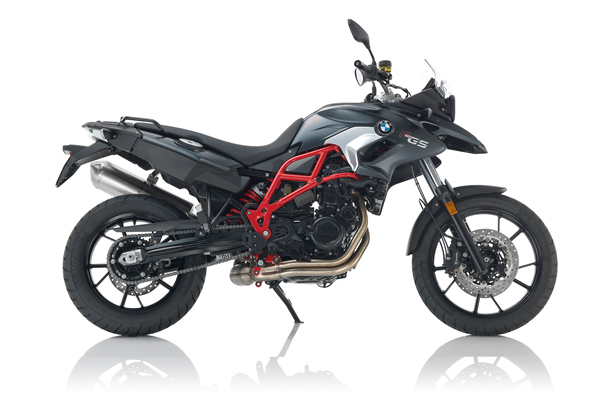 When it comes to riding dirt and experiencing spectacular scenery, this is the real deal! The tour out-shined my wildest expectations on every level! I really enjoyed the “go at your own pace” format of the tour. Great for the faster riders and the slower riders as well. I wouldn’t hesitate to book another tour with Compass; in fact I wouldn’t book with anyone else. Really professional and really great to deal with. We both love riding and what better way to see a place like this, its pretty darn spectacular! Wilder than my best imaginings, these guys are awesome! The scenery is beyond words and it’s a fabulous experience! If I had twelve months to live, I would book Compass Expeditions for the remainder of my life! What an amazing tour. Given that neither of us have done more than farm track and car park gravel before, to say it was hard work was an understatement, but with leo’s guidance, a real learning experience. Leo was awesome. Lots of knowledge, very friendly, always smiling, great sense of humour, first class person. Tavo could not do enough to please everyone, what a great guy. Andy tried so hard to please, very friendly guy a real asset to the team. As for the Compass organisation – wow. Nothing was not thought of, every little detail was covered. The support & backup were first class & I doubt could not be bettered. As for the locations & scenery! Patagonia was always somewhere as a young rock climber I always wanted to come to but never got the chance, now I have seen the best of it with Compass, it has gone way beyond my expectations, a wonderful & enchanting place. This trip has inspired us to do more. We will be riding with you again for sure, now we have coped with some tough terrain. I absolutely loved the trip, utterly absorbing. 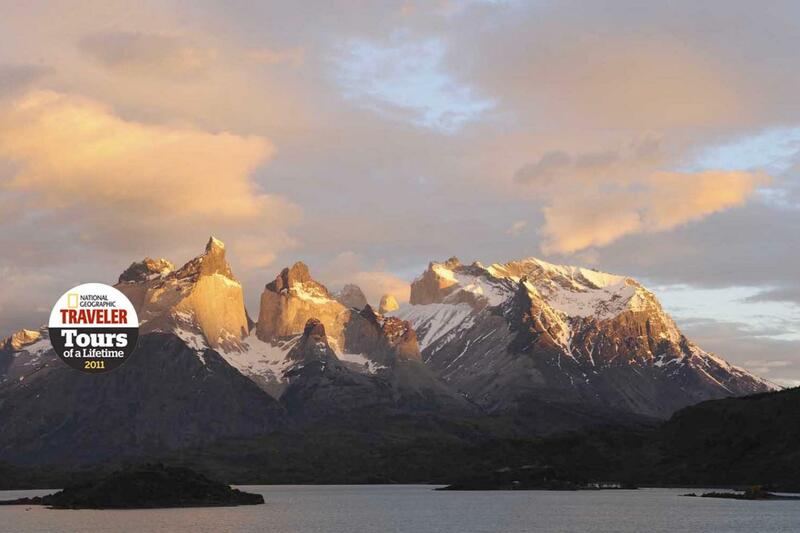 We recently returned from a Patagonia Explorer trip and are not surprised about the recognition by National Geographic. We found the trip to be an incredible experience. The pre trip information was terrific and any additional queries were answered quickly. The trip itself was unbelievably well run, a credit to your Tour Leader (Leo) and Support Driver (Andrew). The research and pre-planning that went into organizing the trip showed through in the easy and safe way we journeyed through Chile and Argentina. We are that confident that all tours run by Compass Expeditions are approached and conducted in the same manner and hence at the earliest opportunity we will be doing another trip with Compass Expeditions. 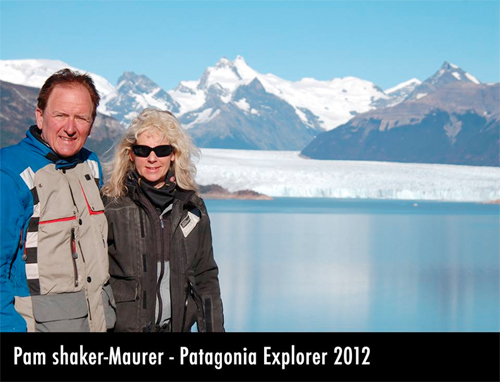 Sue and I have recently come back to OZ after having done Compass Expeditions’ Patagonia Explorer Tour – Ushuaia to Pucon. We want all at Compass to know what a fabulous tour it was in every respect, so much so that we intend doing one of the Highlights of Peru tours in 2013. Our tour leader Hans, and support vehicle driver, Silvana were just ideal for their respective roles, and could not have been more supportive to the group – nothing was too much trouble. They worked together so well that each ride day flowed smoothly from start to finish – loading bags, ensuring everyone’s hotel bills were paid, setting up the scrumptious picnic lunches, fuel stops, coffee stops, photo stops, unloading bags and finally, ensuring everyone was settled into the new accommodation. Plenty of options were given for things to do on non ride days, and the information sheets handed out throughout the tour were very comprehensive. Hans and Silvana’s assistance during the various border crossings enabled the transition to be carried out relatively quickly and with a minimum of fuss. They really are a credit to Compass and we’d love to be able to tour with them again. The food throughout Argentina and Chile was mostly excellent (only a couple of not so good choices on our part), and the steaks sensational (everything I expected them to be), not to mention the asado at Estancia La Angostura. What a blast. I can’t speak highly enough about the tour, your staff, the whole thing. It was sensational from go to woe. Thanks for everything mate, we all intend on riding with you again. We had a great vacation! Everything was wonderful. Hans was a terrific tour leader, and I think we all felt very safe under his direction. I had been a little apprehensive about having 12 bikes traveling together, but it worked out great. Everyone rode at their own speed, stopping to take pictures, adding or subtracting clothing as the weather changed etc, then we all waited until the group had reassembled before we moved on. Silvana and Thomas did a wonderful job also. Having the truck stay behind the last rider was also comforting. In one instance one of the group got separated from the rest and he just waited until the truck appeared! Pam and I were also grateful to have the opportunity to ride in the truck on the ripio. It was so rough for such long distances, that we were happy to let the guys ride by themselves, and I’m sure they were equally happy not to have us to worry about on the back while negotiating the bumps! The accommodation was great on the whole and the food was terrific. I don’t think we had a bad meal the entire trip. Hans, Silvana and Thomas made us some wonderful lunches, and although I don’t often eat lunch, I was ravenous when we stopped and I ate far more than usual! The dinners provided by Compass were also very good. were breathtaking. Even Patagonia with its miles of nothing and big sky had a charm of its own and gave time for a bit of self reflection! 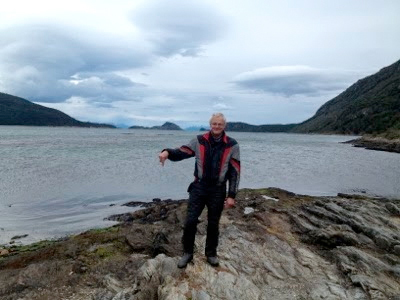 Reaching Ushuaia was unbelievable…such a sense of exhilaration! Terrific! Jerry. I had a fantastic time on the tour and I can’t say enough about Hans and Thomas as a team. I’ve done some guiding and rescue work myself in the paddling and climbing fields and I was really impressed with their ability to manage safety, schedule and personalities without seeming to be managing. That’s really a trick as I am sure you know. It was a great trip. Pieter & JC were professional and excellent guides; this was by far the best organised motorbike trip I have been on so far; well done Compass. Hope to ride with you again. Thanks to Compass for the most amazing memories!! I just wanted to thank you personally for all the hard work and contratulate you for the lads you have on the ground for our Patagonia trip. Had a great time. Probably giving everyone the shits by bringing it up all the time, especially at home!